For many people, a garage is a necessity. Whether it’s to store a car, personal belongings or for a work shop, it’s strong enough to handle just about all the elements. Not all garages have to be the same. If you want a customized garage that will compliment your home or other buildings on your property, D Cross Barn Co. can help. We offer more than the traditional metal building for your garage and even work with quality vendors to supply everything you need for your garage; from hydraulic doors to premier windows. One of the biggest advantages of having D Cross Barn Co. build your garage is we pour our own concrete slabs and driveways. We recommend a garage no smaller than 24×30 which is room enough to accommodate one vehicle while providing some storage as well. Your driveway will determine how many doors the garage has and where they’re placed. Attached or detached, many people turn to gutters and overhangs as a means to increase the appeal of their garage. We have many different colors for you to choose from when customizing your garage and ensuring it compliments your home’s exterior. 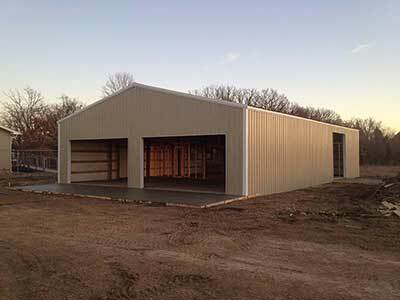 With our wide selection of options your garage or post frame building will be designed and customized the way you want it. Hundreds of home and business owners have trusted D Cross Barn Co. for their custom barns, and you can be rest assured that we stand behind you and your project to ensure 100% satisfaction. Every step of construction allows you to experience the D Cross Barn Co. advantage, providing a reliable, sturdy garage that will last.